Over the holidays, Kate and Drew decided that the time was right to move into the new space. 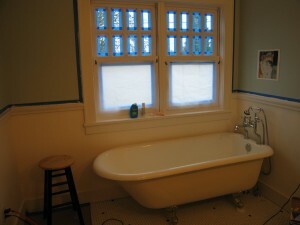 The hardest thing of course, was bringing the tub up the stairs and into the bathroom. After the tub, everything else seems easy by comparison. 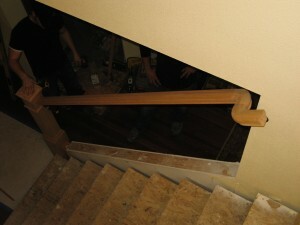 The stairs and railings are being finished this week, and are adding detail and scale to the space. 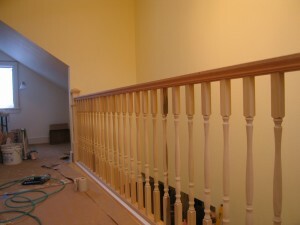 Notice the way the hand rail curves around the wall providing a continuous railing (as required), but allowing more room at the bottom of the stair from the entry. 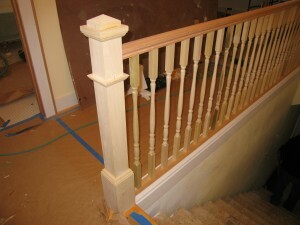 The newel posts provide a sturdy anchor for the railing and are another opportunity for additional detail. Now that the lights are in, the whole space seems a lot less temporary and the workers are relieved of dragging utility lights around with them. 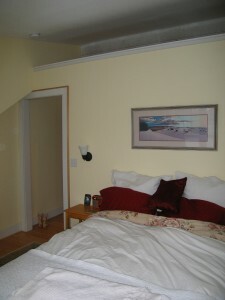 The wall between the bedroom and the closet ends about 16 inches from the ceiling. 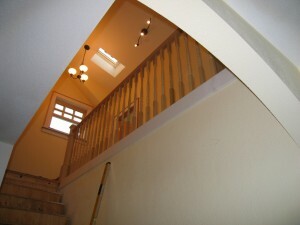 This gap allows the ceiling to flow from the bedroom to the closet, expanding the virtual space of both rooms.